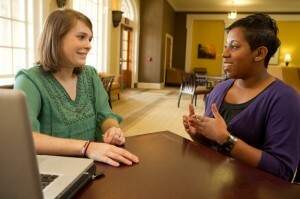 Senior Rebecca Hinson, at left, interviews academic advisor Tiffany Waddell for her Wake at Work oral history project. Students in Michele Gillespie’s history class are studying the history of work in America by starting with those who make Wake Forest work: staff and faculty. 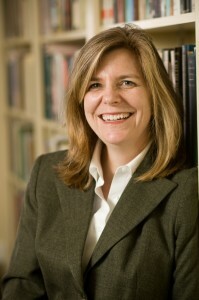 Using the University as an example of the contemporary workplace exposes students to a variety of jobs before they begin their journey back to colonial days to trace how work — individually and collectively — has shaped American history and expectations about the American Dream today, Gillespie said. The students in her upper-level class, America at Work, are studying how what people do has shaped the nation’s history, from the colonial era through the slave economy and Reconstruction; from the Great Depression to the post-war business boom; and from the rise and decline of manufacturing to the transition to the service economy today. As part of an oral-history project, Wake at Work, students are interviewing about 20 staff members and several professors, asking them about their family background and how that influenced what they wanted to do when they grew up; how they chose their particular occupation and why they came to work at Wake Forest; what they do now and what they like about their job; and their hopes for the future for themselves and their children. Transcripts from the interviews will be published on a website later this year. Students are interviewing staff members in Admissions, Athletics, University Advancement, Career Development, Facilities and Campus Services, Financial and Accounting Services and in other offices, and at Graylyn International Conference Center and Reynolda House Museum of American Art.